HR Manager Eduardo A. recounts his experiences after the devastation of Hurricane Maria. In September 2017, Puerto Rico was devastated by Hurricane Maria, one of the strongest storms to directly strike the island in more than a century. In the weeks following the storm, Enterprise employees acted quickly – coming together to ensure the business could get customers where they needed to go, even while their own lives were afflicted. 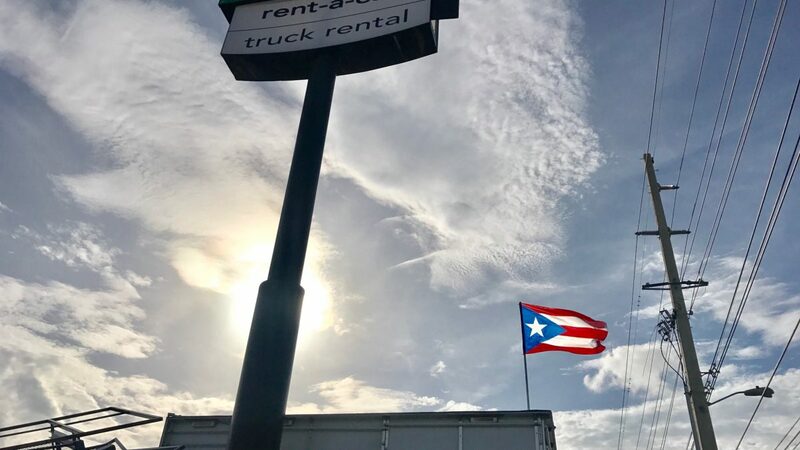 In this story, Eduardo A., HR Manager in Puerto Rico, provides a firsthand account of his experiences after the storm and the resilience and dedication of employees who went above and beyond. On the morning of Sept. 18, the department heads in our administrative office met to discuss our readiness plan in preparation for Hurricane Maria. Having just endured Hurricane Irma, we felt confident in our plans; however, nothing could ever have prepared us for what was to come in the following days. High winds and torrential rains began on Sept. 19 and by early morning the next day, Hurricane Maria made landfall. The Category 4 storm hit the island with sustained winds of 175 mph and three feet of rain and impacted literally everyone who lives here. In only one day, everyone in Puerto Rico lost power, water and communications – pushing everyone into a state of shock and disbelief. What had once been a lush green island was now completely brown and buried in debris and water. By the afternoon of Sept. 20, the winds slowed enough to start assessing the damage of homes. All our employees were impacted by the storm. Some lost their homes and everything they had. After FEMA and the Army Corps of Engineers cleared the roads the best they could, some of us made our way back to work. With no phones, TV or internet, it was nearly impossible to communicate with loved ones, family members and coworkers. Our General Manager Bill and Group Rental Manager Luis made it very clear our first priority was to make sure our people were safe and sound. Fortunately, apart from material damage, all 229 employees were safe and accounted for. Flooding and debris forced extensive road closures. No supermarkets were open. The airport was closed to commercial flights. What happened next is something that none of us will ever forget. Slowly, despite this devastation, our employees started to show up for work. We made the San Juan Airport branch our hub in the aftermath of the storm, opening only to first responders. At the same time, we started the process of opening our administrative office and focused our efforts on getting the branches we could open operating as fast as possible. All the branches on the island were damaged with some completely destroyed. The resilience and dedication our employees showed after the storm was unbelievable. Despite food shortages and a lack of power, water and telecommunications, everyone showed their true colors and stepped up to the challenge. The week following the storm was particularly trying. Many of our employees waited in line for more than 10 hours just to buy five gallons of gas, only to be turned away at the last minute because the supply ran out. As supermarkets opened their doors, lines were incredibly long – many waited for hours to get food and options were extremely limited. Money at ATMs was in short supply and in some cases nonexistent. These weeks and months after the storm are the hardest the Puerto Rico team has endured. Still today, nearly 43 percent of Puerto Ricans are without power. We never fell or gave up – we joined together to fight through and came back on top. We will succeed thanks to the hard work and dedication of every single one of our employees who has gone above and beyond for their teams and, ultimately, our customers. Muchas gracias por ser tan excelente!! Viva Puerto Rico! !